Welcome to Jordan & Skinner. 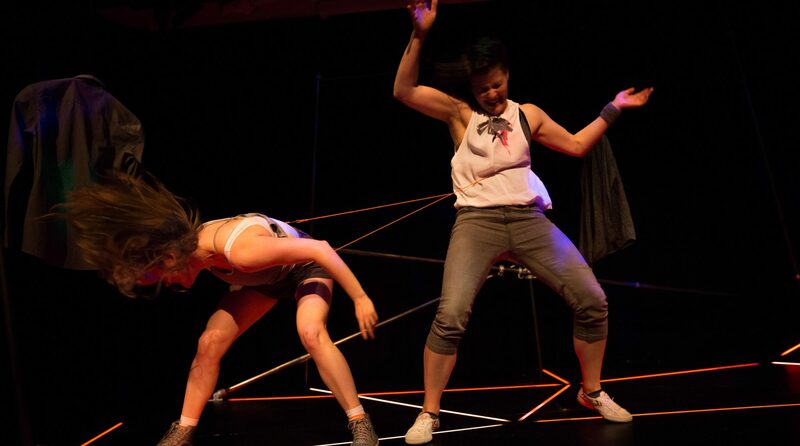 Jordan & Skinner are a theatre company who want to see a world in which women take up space*. We are based in Scotland and lead by performer Melanie Jordan and director Caitlin Skinner. We make joyful performance about the stuff that makes us angry. Our style is a mix of physical theatre, clown, dance, politics and visual metaphor with an unapologetically militant intersectional feminist agenda. Thanks for visiting our site. Here you can find out about all our work past, present and future. Please make yourself at home. The kettle is always on. Check out our social media for the most up to date bizniz. WE GOT A FANCY FELLOWSHIP! We are delighted to announce that Jordan & Skinner have been awarded an Artworks Alliance Fellowship through Creative Scotland in assocation with the Barbican. YAY! This fellowship will allow us the space and time to get better at what we do. Throughout the next few months we will be interviewing people, recording a podcast, running workshops and going out to see inspiring pieces of art as we think about the relationship between art and activism in our work. Lucky us! We are also delighted to announce that through our fellowship, Jordan & Skinner will be Associate Artists at Platform for 2018/19. We LOVE Platform and are so looking forward to working with everyone there throughout the year. You can read a bit about our attachment on the Platform website here.